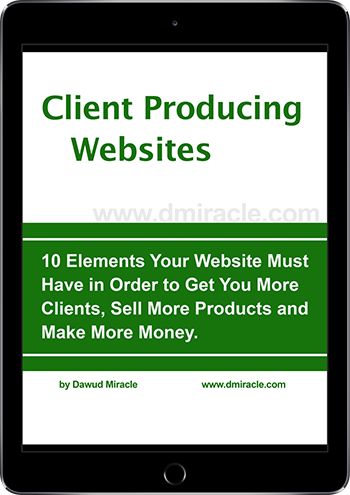 Get your FREE 39-page guidebook, Client Producing Websites: 10 Elements Your Website Must Have in Order to Get You More Clients, Sell More Products and Make You More Money. As a coach, holistic practitioner or any other type service provider, you want a website that will generate more leads, get your more clients and help you sell your products and services. It’s likely you’ve been told by tons of so-called experts all sorts of things to do to make your website sell your offer. But what makes your website work for your business? What do you actually need to do to get the results you want? How can you finally have a website that delivers people who are ready to buy from you? Element #3: Get a Blog and Use It! And, of course, there’s more. The last page is the 10 Elements on a single page with a brief summary for each that you can print, put by your computer and use as a guide every day. And on top of all that, I even have some special offers for you that are only available once you’ve read the Guide. So let’s get you a copy of my free Guide right now. Simply fill out the form below and you’ll immediately receive it by email. 10 Elements Your Website Must Have In Order To Get You More Clients, Sell More Products, And Make More Money. See exactly how top coaches, healers & others service providers are successfully using their websites to create a following of people who buy their products and services. When you request Client Producing Websites, you’ll also begin receiving useful articles, helpful tips and excellent resources for creating a more effective website and building your following on the internet. Of course, you can unsubscribe at any time. *And please note, I will never sell, loan or share your email address (or any other information about you) with anyone else for any reason whatsoever. I abhor spam and am committed to making sure your email address is secure.